Many Americans have a clichéd understanding of underperforming and underfinanced American schools — of why certain states have underperforming schools, of the connection between inadequate teacher salaries and student underperformance and, importantly, of the political environments that produce those outcomes. According to this understanding, those school districts receiving the lowest per pupil income generally underperform well-funded school districts; poorly paid teachers underperform better paid teachers and conservative Republican governors and legislatures prioritizing low taxes are largely responsible. Like many clichés, this is at least partly true. Weakened teachers’ unions and teachers’ salaries do reliably predict below average student test scores. By and large, Republican dominated state governments have created the right-to-work, low-tax environment that’s weakened American education, even driving many teachers out of a profession where salaries have declined for years. As salaries have declined, so have U.S. student test scores relative to test scores in other countries. But the reality is more nuanced. Liberal, Democratic-dominated state governments have also contributed to the problem. 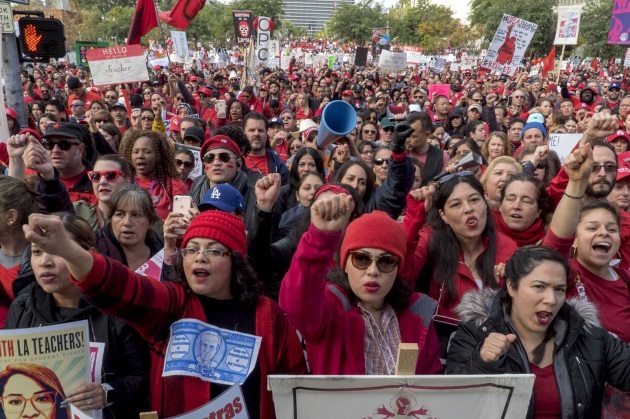 The current Los Angeles teacher’s strike illustrates this more complicated reality, where despite good intentions, liberal legislatures and supportive communities have all contributed to a generally hostile environment for primary and secondary education. Left, right or center, it all comes down to whether Americans are willing to pay for the education they believe their children deserve. In reality, low wages in the U.S. are not unique to the teaching profession. They are somewhat worse than wages for similarly educated Americans generally, but they’re of a kind; average US income has hardly risen at all over the past 40 years, and proportionally greater percentages have gone increasingly to the wealthiest Americans, not the middle class. Primary and secondary school teachers’ salaries range from a low of $42,460in Oklahoma to highs of a little over $81,000 in Alaska and New York. This puts teacher salaries in the general range of 2018 U.S. household (not individual) incomes, which average $62,175. This fact — that teacher’s salaries aren’t much different from U.S. salaries generally, is a significant reason teachers and their unions haven’t made much headway in convincing legislatures and elected officials teachers deserve a raise. Many Americans feel they deserve better themselves and note that many teachers already earn more than the U.S. average. Without motivated voters who want to do better by teachers, politicians, regardless of party, have shown little enthusiasm for raising taxes necessary to increase their salaries. The origin of the crisis in education in California, the most Democratic large state in the union, isn’t very different from its origin in Republican-leaning, low-tax states; voters don’t want their taxes raised to pay for education. This is less obvious in California, because Californians haven’t directly voted down salary increases for teachers. Instead, in 1978 they voted in Proposition 13, which rolled back property taxes to 1976 levels and put an annual 2 percent cap on subsequent increases, which is lower than the historical inflation rate. As a result, property taxes in California are a dwindling source of state income. But almost 60 percent of the funding for public school education in California comes from property taxes, with the result that year after year less money (in constant dollars) is available for California’s public schools. Therefore, the salary crisis in California schools begins with the electorate. Los Angeles school teachers face the same budget constraints as other California teachers, but for a couple of reasons the impact is greater. The largest West Coast cities have all become relatively unaffordable for the middle class and Los Angeles is one of the worst examples, where the average rental for a two-bedroom apartment is nearly $3,000 per month. Since L.A. teachers make about $63,000 a year, this means a family of three will likely spend nearly 50 percent of household income on housing. But the public education crisis in Los Angeles goes beyond teachers’ salaries. The same Prop 13-induced squeeze on education has also resulted in thinning support staffs, inadequate classroom resources — which means that sometimes teachers have to buy their own supplies — and class sizes that sometimes exceed 50 pupils. As a former teacher. I know that delivering personalized instruction to 50 students in a 50-minute hour isn’t possible. With young students in a class, even maintaining some sense of order and keeping attention directed on an instructional outcome is somewhere between difficult and unlikely. These would be stressful teaching conditions in any city, but L.A. has one of the two highest poverty rates in California and the highest percentage — 24 percent — of English language learners of any large California city. This means Los Angeles has to spend more of its limited public funds teaching students English in addition to the normal curriculum and that many of these students enter the classroom without the psychological assets that parents with middle-class incomes can provide. Overall, Los Angeles and California seem to be in a state of denial, not just about how bad the situation is for LA teachers, but about the cost of the available remedies. LA schools leader Austin Beutner agrees that there’s a problem, but claims there’s no money in the LA school budget for salary increases or for any of the classroom improvements teachers are demanding. Strictly speaking, this is true. Many teachers are infuriated by this response because it suggests that no one in government is in their corner. The state of California, as the teachers’ union’s leaders have noted, is sitting on a $21.4 billion budget surplus. Some of that money could be directed to public school education. It’s also the case that California’s voters — a majority of whom now support the L.A. teachers’ strike — did much to create this problem when they voted in Prop 13. Wringing of hands (where is the money supposed to come from?) rather than making voters aware of the need for at least a partial restoration of the tax income lost with Prop 13 is irresponsible. What happens next will likely determine the course of public school education not just in LA, but all over the country. If the education-affirming California Democratic Party can’t or won’t resolve the crisis, it seems even less likely that other states with similar budget crunches and a less progressive electorate will figure out a solution. That would be unfortunate. Similar strikes are brewing all over the country; the next major teacher’s strike is scheduled to begin on Feb. 5 in Chicago. On the other hand, if L.A.’s teachers succeed in forcing California politicians and their voters to change course and, for the first time in 40 years, address the underlying tax deficiencies that have led to the present crisis, this may be a turning point for U.S. public school education funding generally.